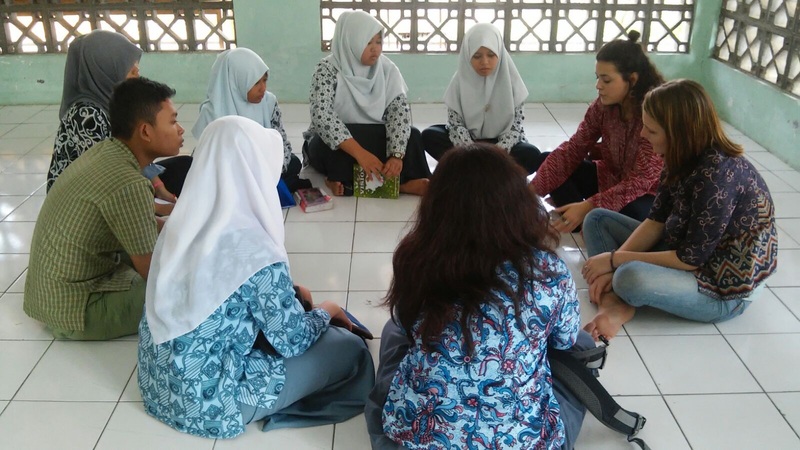 As the 2015-2016 Fulbright English Teaching Assistantship grantees continue to teach, learn, and live across Indonesia, they are still finding new ways to engage with their communities in and out of the classroom. Below are monthly highlights from November and December 2015 about these engagement efforts from ETAs placed in Sumatra and Central Java. 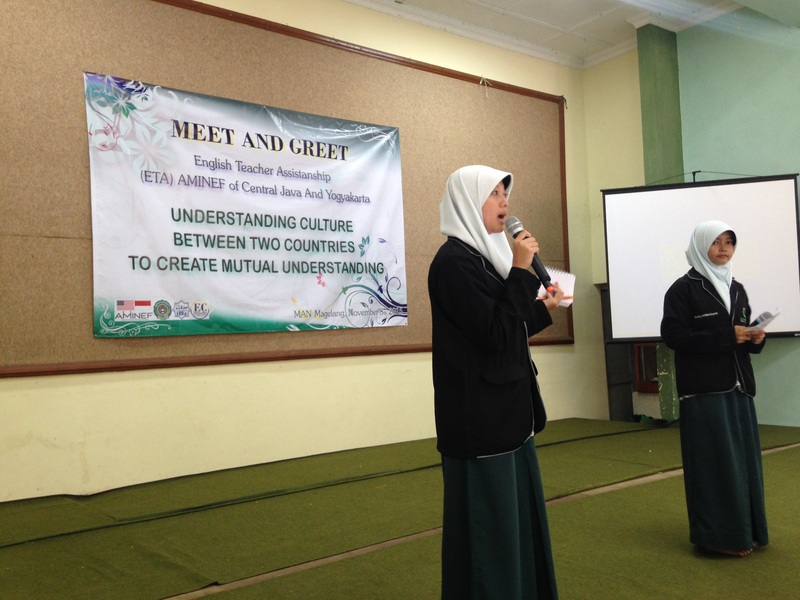 In early November, ETA Safiyah Ismail organized a Central Java ETA Meet and Greet Event at MAN Magelang where all the Central Java ETAs met students at MAN Magelang for a cultural exchange event. There were four focus-sessions led by two ETAs each on the following topics: High School in America, College in America, Study Skills and Tips, and Study Abroad Opportunities for Indonesian High School Students (and how to make yourself competitive for such opportunities!). Eleven high schools from around Magelang attended the event and information regarding study abroad opportunities were distributed to the eleven schools in attendance. 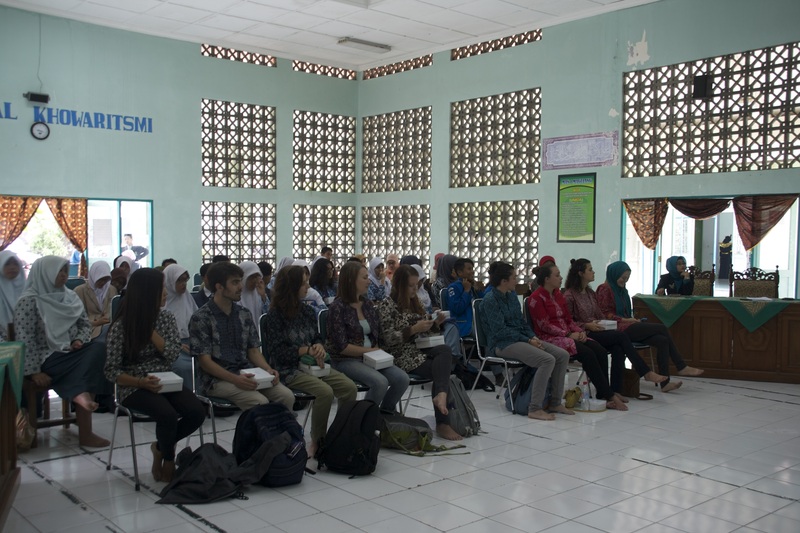 Magelang ETA Savannah Trifiro and Semarang ETA Hilary Skov speaking with a group of students at an event held at MAN Magelang. ETAs from Central Java gathered at MAN, and the students came from various high schools in Magelang. Here they are comparing and contrasting high school in Indonesia and America. The conversation was held almost entirely in English, and the students were able to ask the ETAs any questions they had as well as contribute their own insights. Afterwards, two volunteers from the group presented their findings to everyone else at the event. 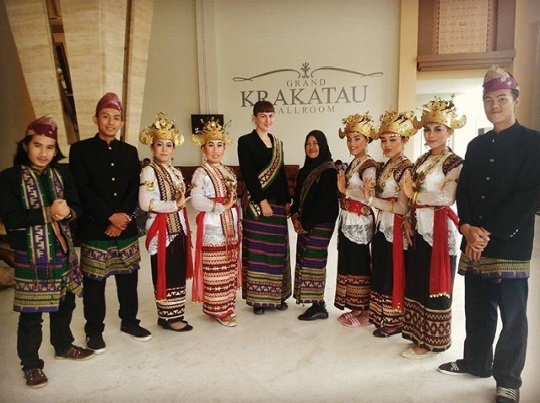 On the evening of Friday, 6 November, sitemates Kelly Fitzgerald and Caitlin Jordan accompanied the family and friends of Yoga, a student at SMAN3 Pangkal Pinang (Kelly’s school) to cheer him on during the grand finale of the Bujang Dayang competition. Bujang Dayang is similar to a beauty pageant for young men and women, during which contestants must demonstrate physical grace and verbal poise when answering difficult questions. Yoga won an honorable mention as the Most Talented male contestant for his skill in playing the dambus, a local stringed instrument. 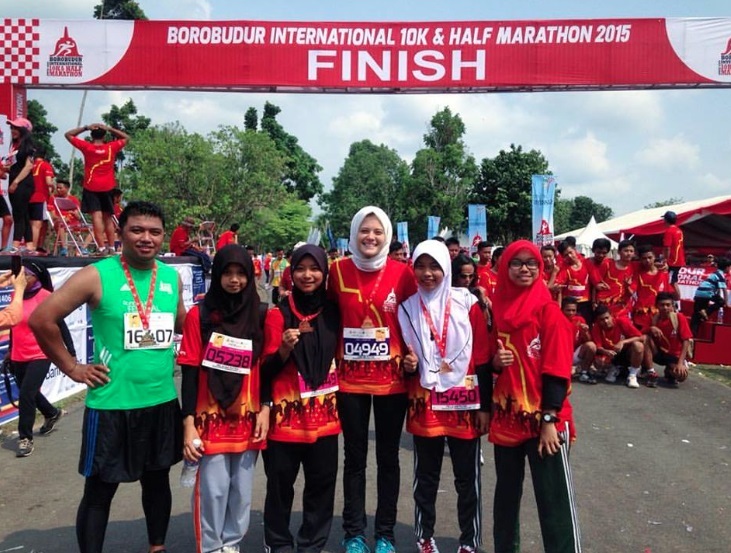 ETA Safiyah competed in the Borobudur International 10k running competition with her students from MAN Magelang. One of ETA Safiyah’s hobbies is running, so it was a really great opportunity to share a slice of her personal life with her students. 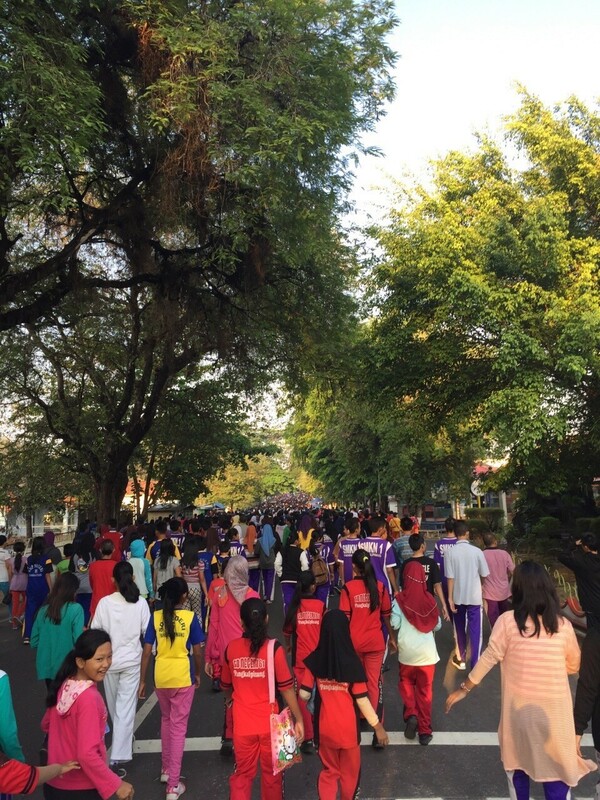 For many of her students, this was their first time competing in a 10k running competition! 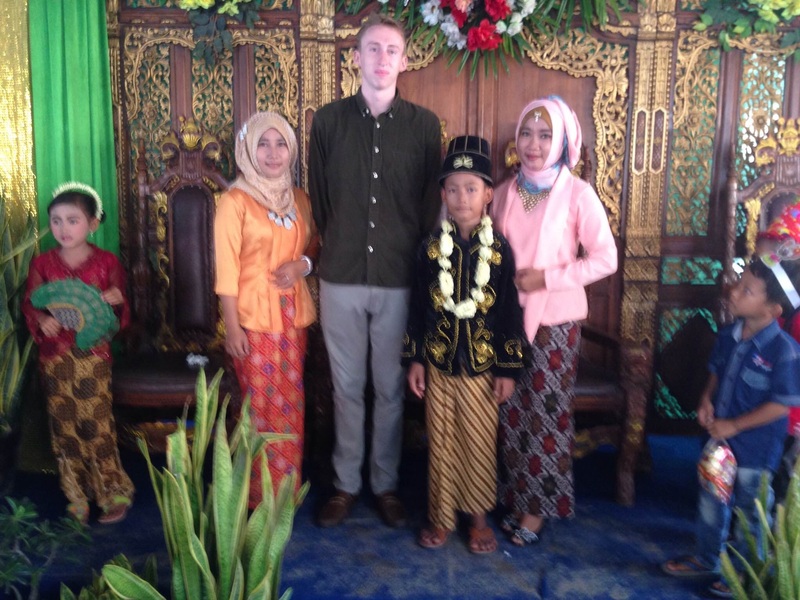 During her short time in Indonesia, ETA Kelly Fitzgerald has held countless children and been invited to dance in public (sometimes simultaneously) with unprecedented frequency. 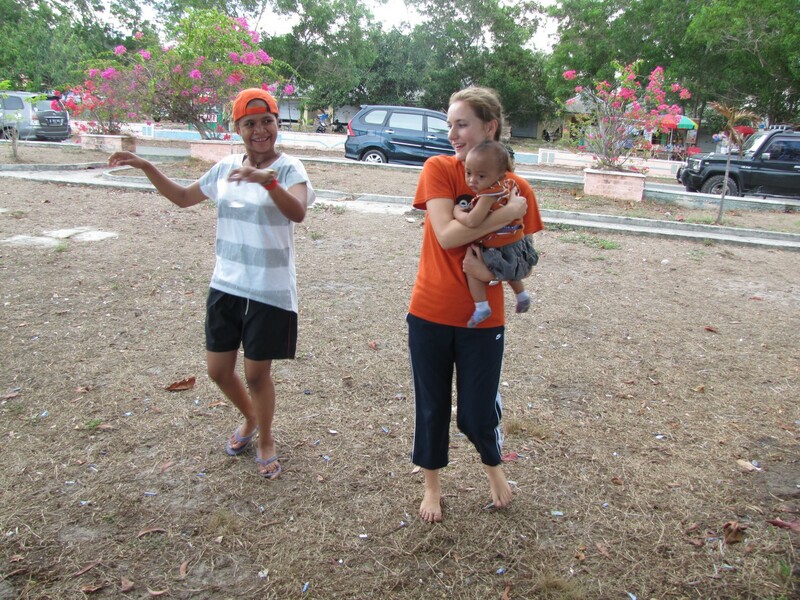 In this photo, Kelly is receiving dance instruction from Dhea, a student at SMK 2 Pangkal Pinang (sitemate Caitlin Jordan’s school). 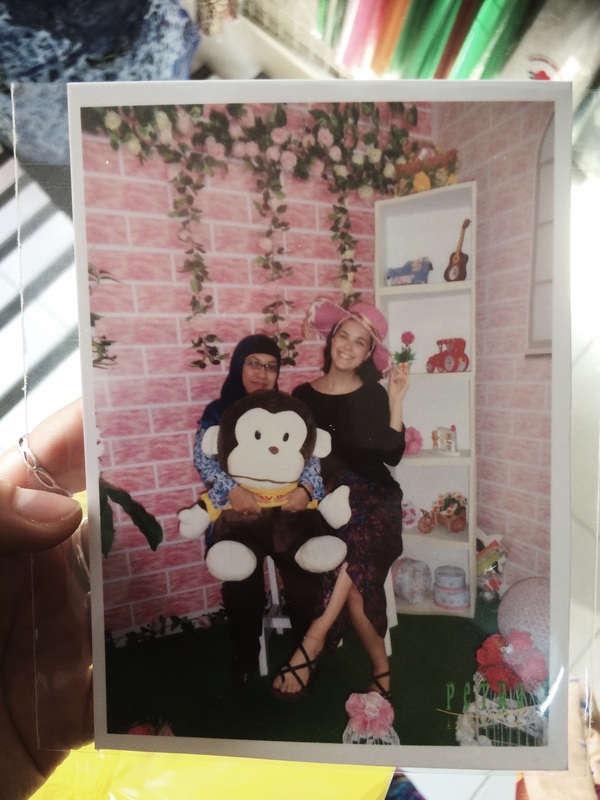 Kelly is at Pantai Matras with Dhea and her extended family to celebrate Dhea’s brother’s birthday. Shortly after this photo was taken, the entire family joined in dancing to the song “Gemu Fa Mi Re,” followed by an impromptu karaoke session during which Kelly sang “Bento” by Iwan Fals and “Sakitnya Tuh Disini” by Cita Citata. In celebration of National Teacher’s Day, a special Jalan Santai (“Relaxed Walk”) took place in and around the center of Pangkal Pinang. Most of the schools in the city – from elementary to high schools – participated in the festivities, as shown by this large crowd of people (that goes from forefront into the distance)! 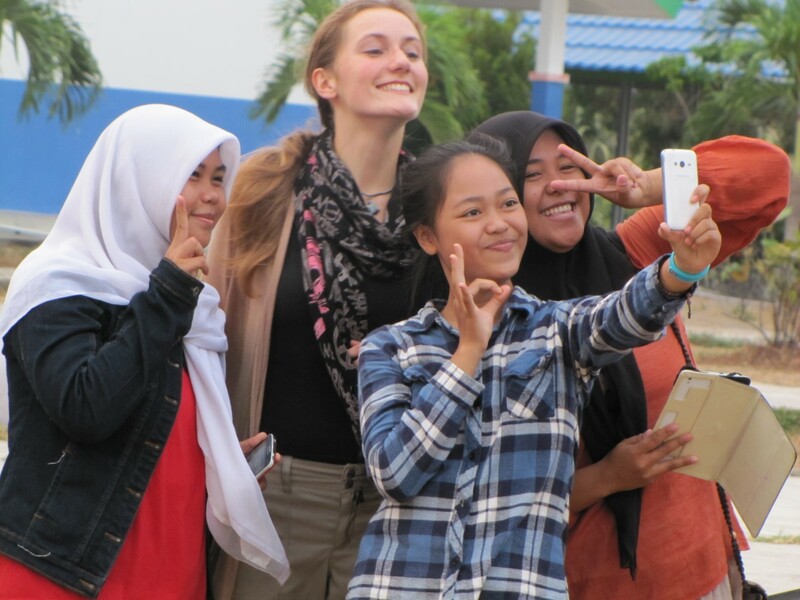 This photo was taken by Ms. Caitlin Jordan as she walked with some of her students and teachers from SMKN 2 Pangkal Pinang. 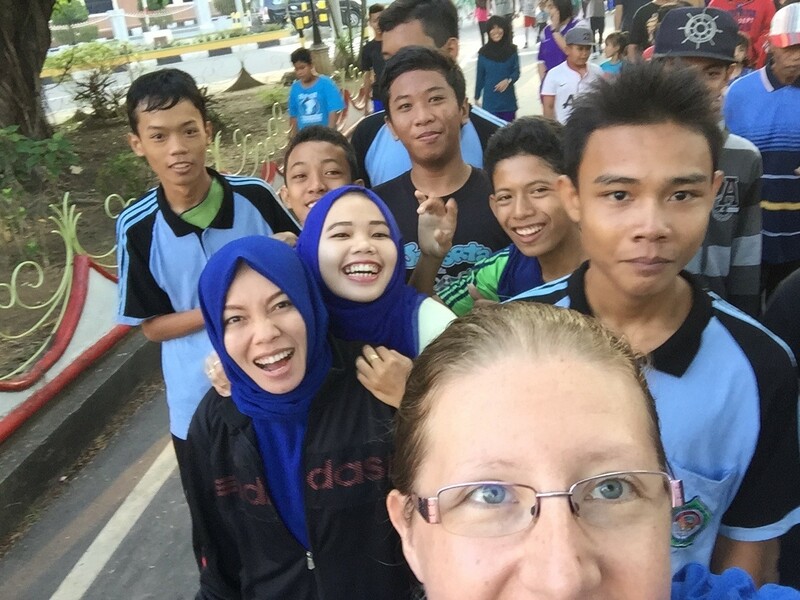 Here is a ‘mid-walk selfie’ taken by Ms. Jordan with her SMKN 2 Pangkal Pinang students and teachers. 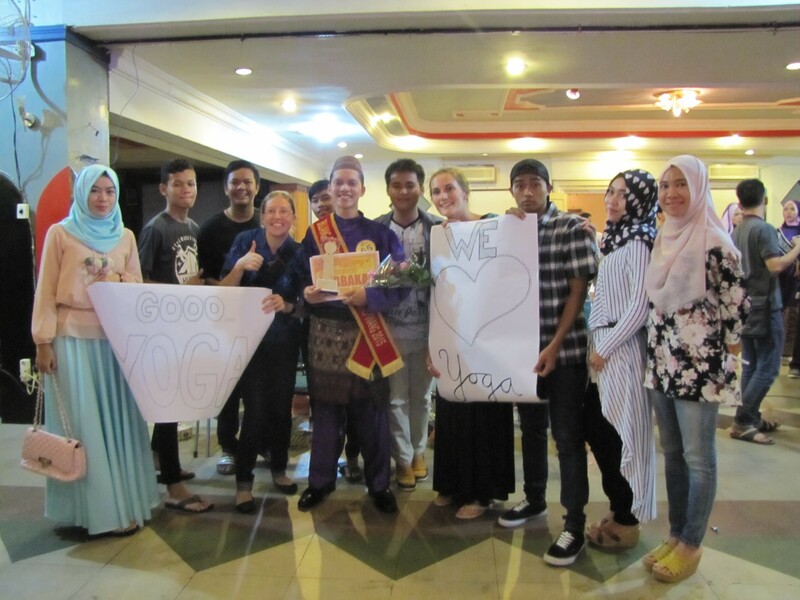 After the walk, there was singing, motivational speeches and a raffle in the city center, Alun-Alun, where some of her students and fellow teachers won prizes! (A rice cooker, rice box, and a mixer – each to different people of course.) 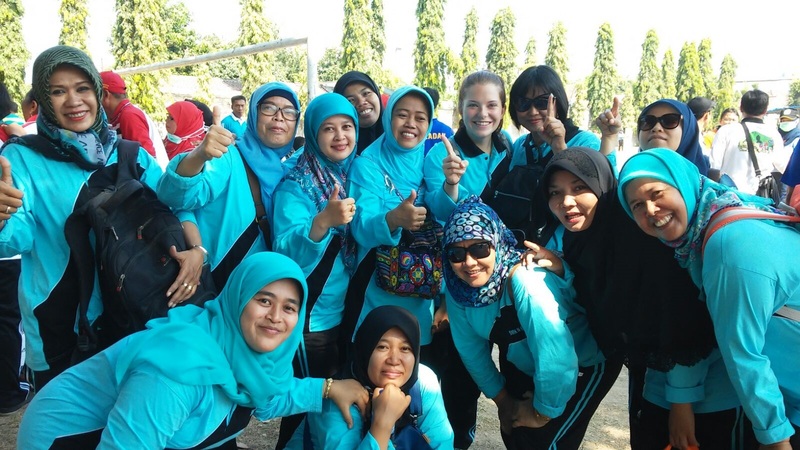 It was a great way to get to know her students outside of the school setting, to stay healthy and fit, and to celebrate all the hard-working teachers in Indonesia. 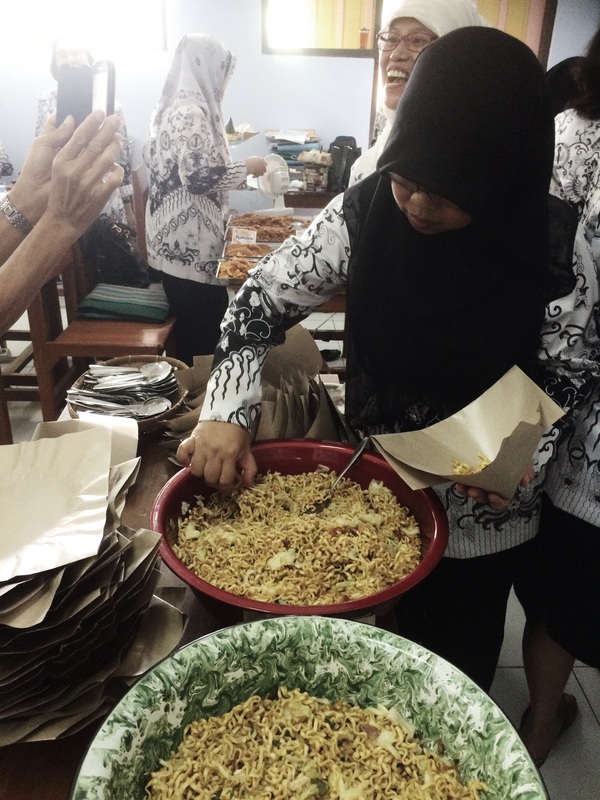 For National Teachers’ Day, ETA Savannah Trifiro and her fellow teachers at SMKN 3 Magelang shared a meal in their temporary teachers’ lounge. 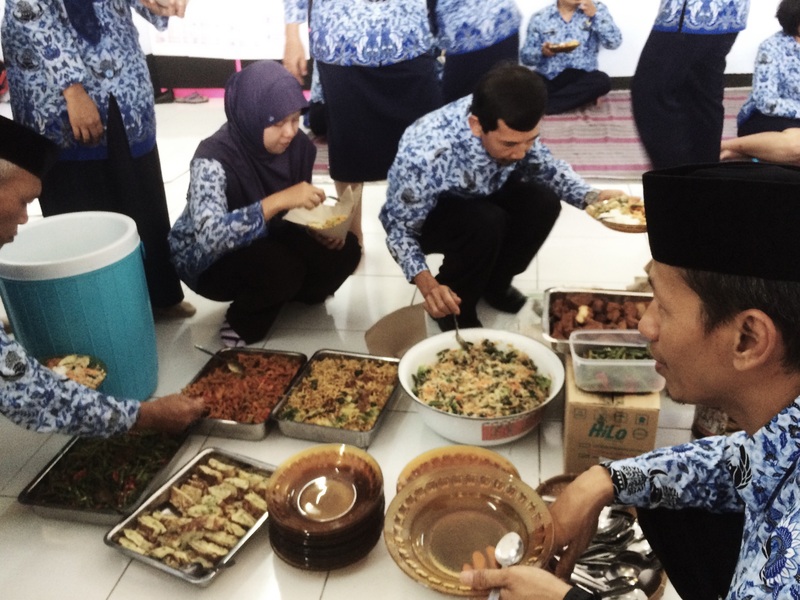 The headmaster made a speech before they indulged in a spread of traditional food, including nasi kuning, or yellow rice, in the form of tumpeng, which is often enjoyed at special events. 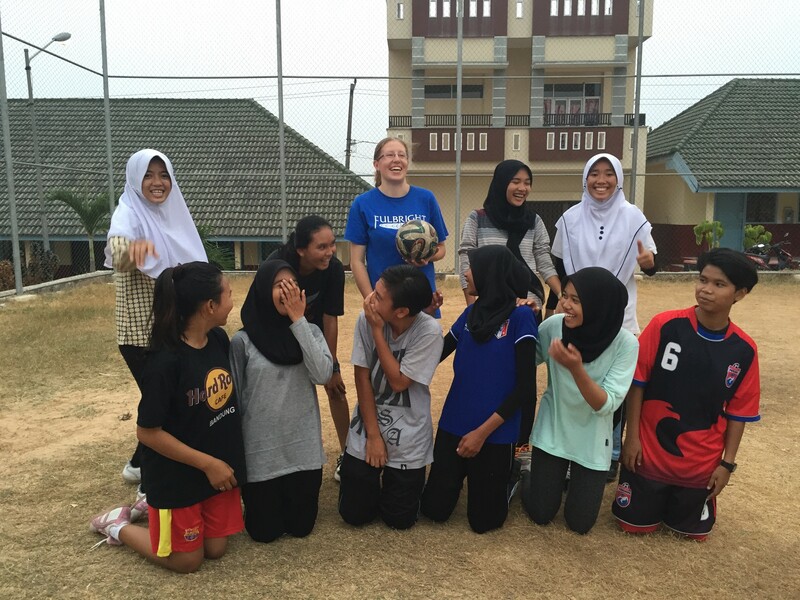 Having been a football/soccer player in the United States when she was young and still playing now (though just for fun), Ms. Jordan helps with the women’s futsal team at SMKN 2 Pangkal Pinang as the assistant manager. Here, she looks on as the girls – in the red pennies – play their bi-weekly match. The SMKN2 team won the game 3-1. They have weekly practices that Ms. Jordan also helps out with and this was one such day (where as always there must be pictures!). They run laps, and work on drills and passing, and do some stretching. Sometimes Ms. Jordan leads the drills, sometimes she watches, and sometimes she takes part in the practice match just for fun. 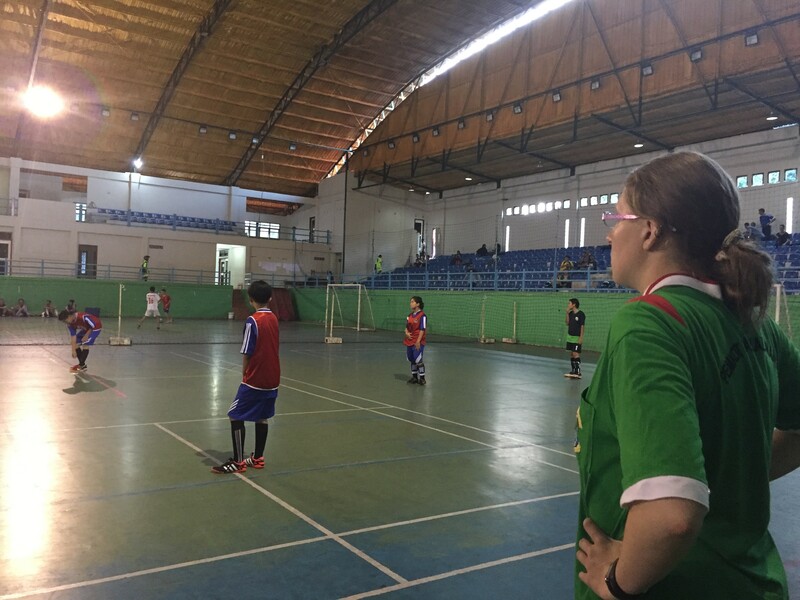 The language barrier is still challenging, especially with sports, but Ms. Jordan is learning quickly and hopes to offer some new drills and ideas for practices, even though the team is already pretty much the best! 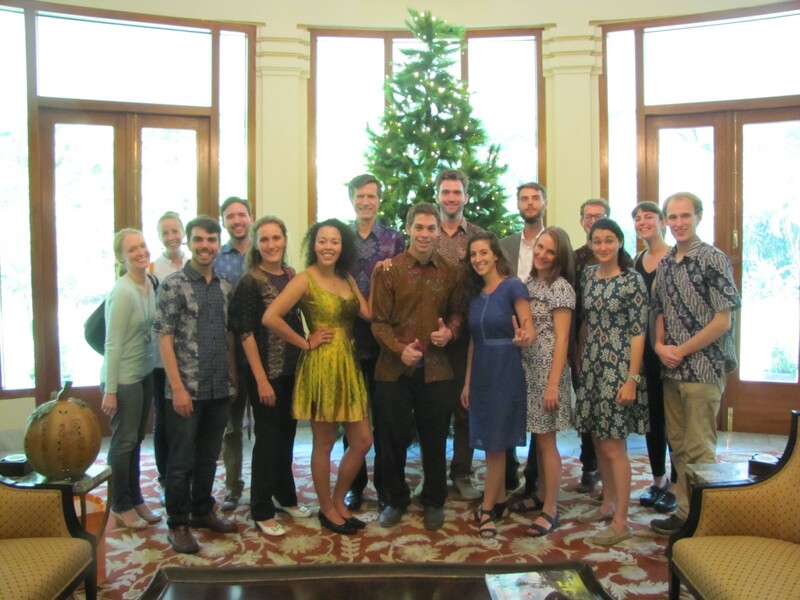 To celebrate Thanksgiving, the American ambassador to Indonesia hosted a Thanksgiving luncheon for Fulbright researchers, English Teaching Assistants, English Language Fellows, Peace Corps volunteers, and other esteemed guests. 12 ETAs were in attendance at the celebration, where they enjoyed sharing stories about their first three months at their sites. 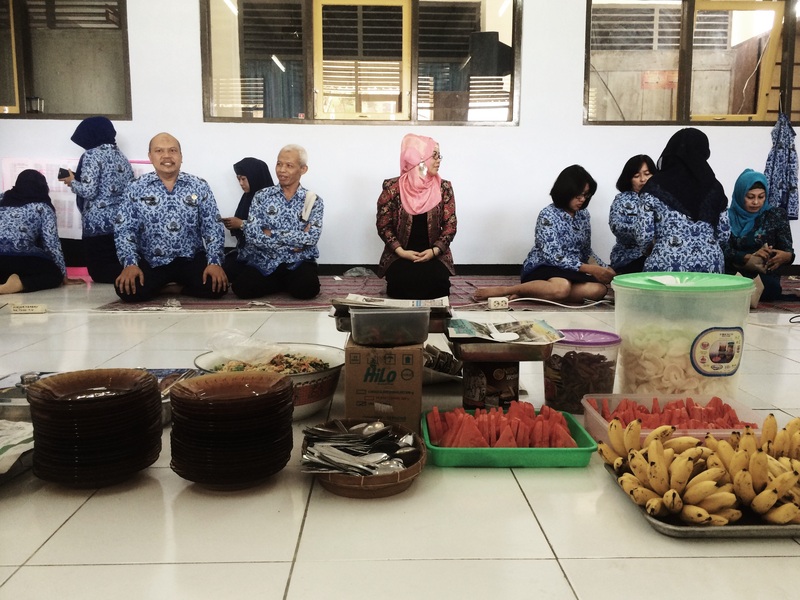 SMKN 3 Magelang is undergoing pretty serious renovations, so shortly after Savannah’s headmaster returned after making her pilgrimage to Mecca, they shared a meal to pray for successful results. They ate together on the floor in their temporary teachers’ lounge. All guru-guru in Yogyakarta from public schools, SMAN and SMKN alike, were invited to participate in an olah-raga event at a public field. 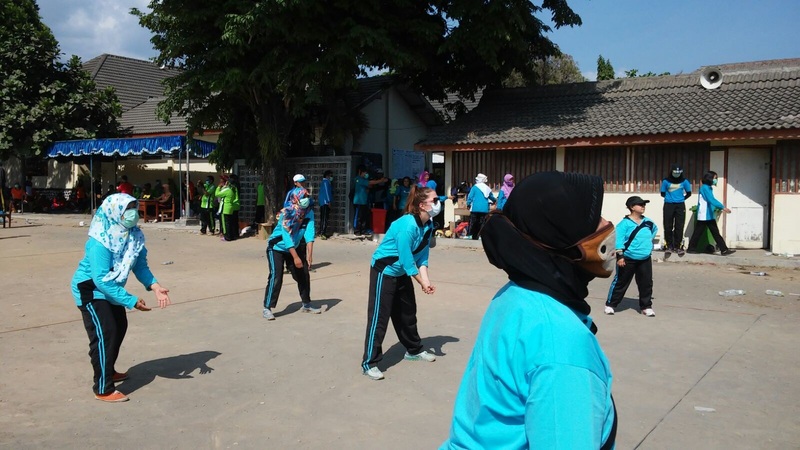 Teachers formed teams within their schools and competed in volleyball, badminton, chess, and a traditional Indonesian game known as Galah Asin or Gobak Sodor. ETA Kendra Reiser had not yet seen many of her fellow teachers outside of the school setting so it was incredible to get to know them on a more personal basis while bonding over the competition. She was lucky enough to participate in the women’s volleyball event and also cheered and danced passionately for all other events she was not competing in. SMKN 6 Yogyakarta ended placing second overall after losing in the final round for volleyball. She is proud of her team, proud of her school, proud of the Jogja guru-guru. At the end of November, Izaak Earnhardt, the ETA at SMK Negeri Binaan in Medan, attended a ceremony to celebrate the signing of a memorandum of understanding between the school and Perumnas, a state-owned construction company. The agreement provided internship training opportunities and post-graduation employment opportunities for the students in the school’s technical drawing specialization. Education and business partnerships like this in Indonesia are one of the main reasons why #SMKbisa. 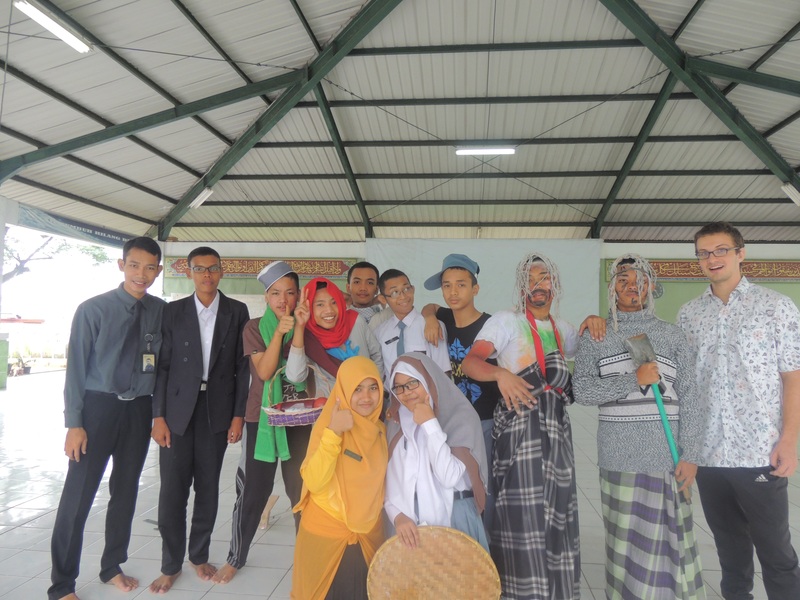 At SMA CT Foundation (CTF) in Medan various tenth grade English language classes were given the opportunity to develop their English skills by performing their theater adaptations of Jack and the Beanstalk and Timun Mas. ETA Christopher Linnan and his co-teacher Mr. Guntar were on-hand to help prepare and assess the students’ performances. This gave the students an opportunity to improve their English speaking skills and develop their self-confidence, as well as an opportunity to demonstrate their creativity via their various costumes and unique, yet engaging performances. ETA Patrick Dougherty at a circumcision party. Many of the people in his community originally come from Java, so this was a Javanese affair, which naturally includes joget, a Javanese dance. He learned how to joget the hard way: being asked spur-of-the-moment to get on stage with his host family and dance in front of the whole party. He also learned that the practice of circumcision (sunat) in Islam is a bit different than a secular circumcision in an American hospital. The boy is many years older (the boy in the photograph is 10) and a celebration is held. In this case, it was quite the celebration indeed as a few hundred people were in attendance. 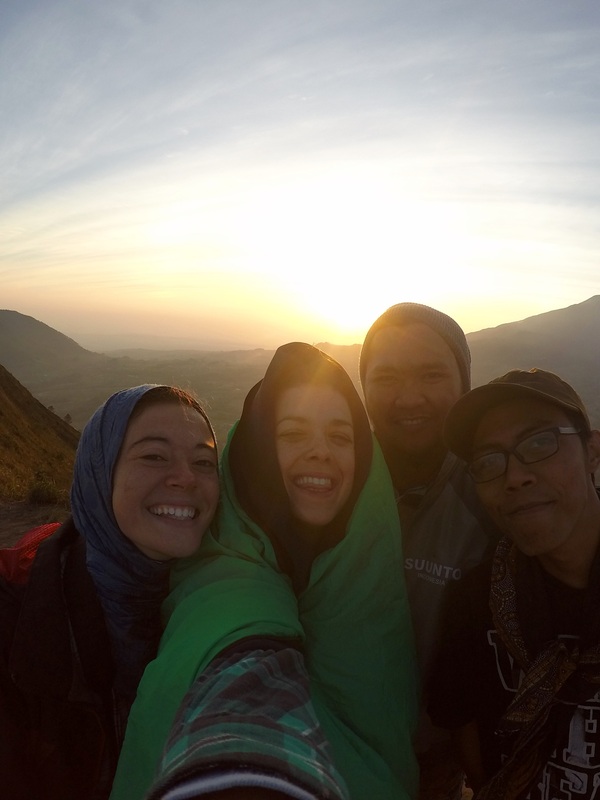 Magelang ETAs Safiyah Ismail and Savannah Trifiro went on a hike to Gunung Andong with two of their friends from Magelang. 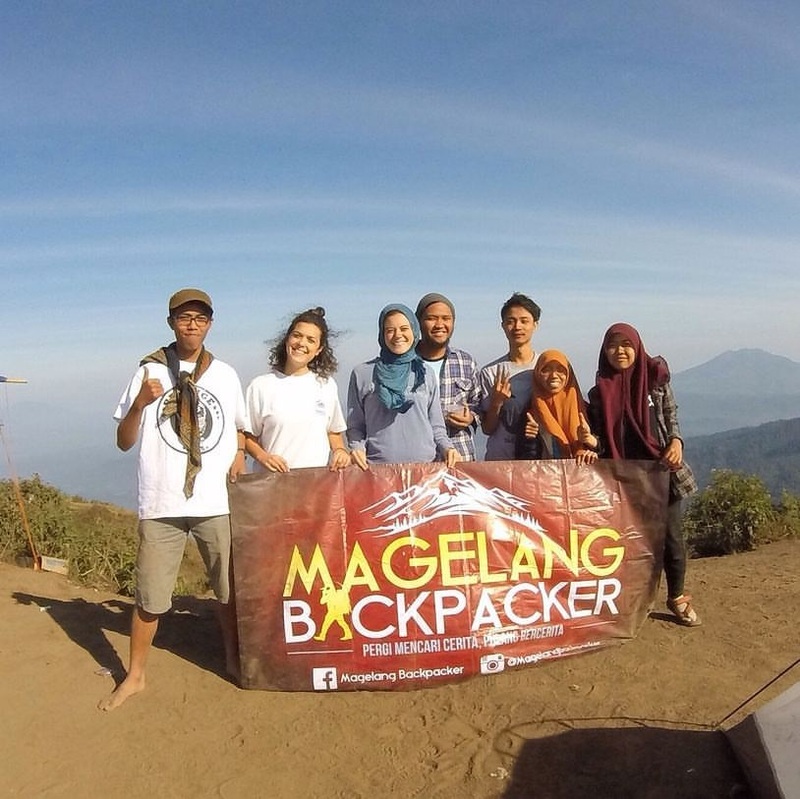 They met fellow backpackers from various cities in Indonesia at the summit. 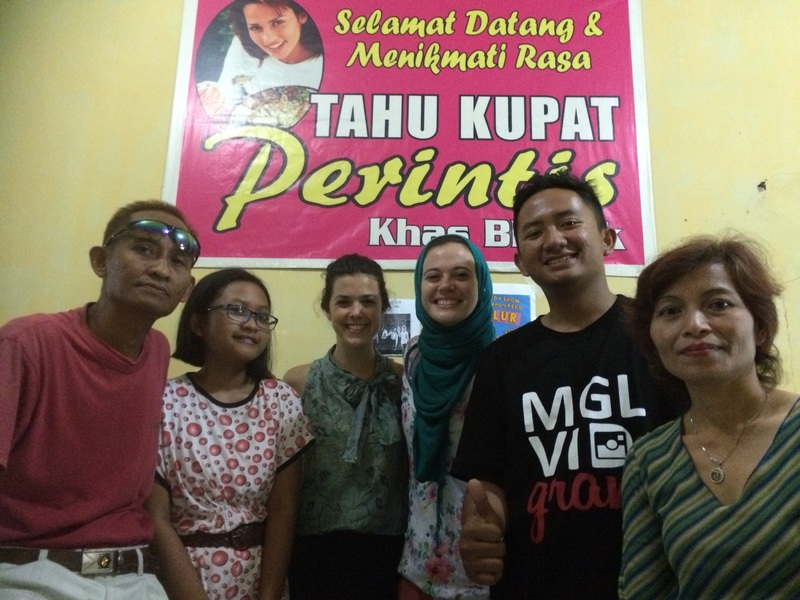 Patrick with the family of one of his friends in Martapura. 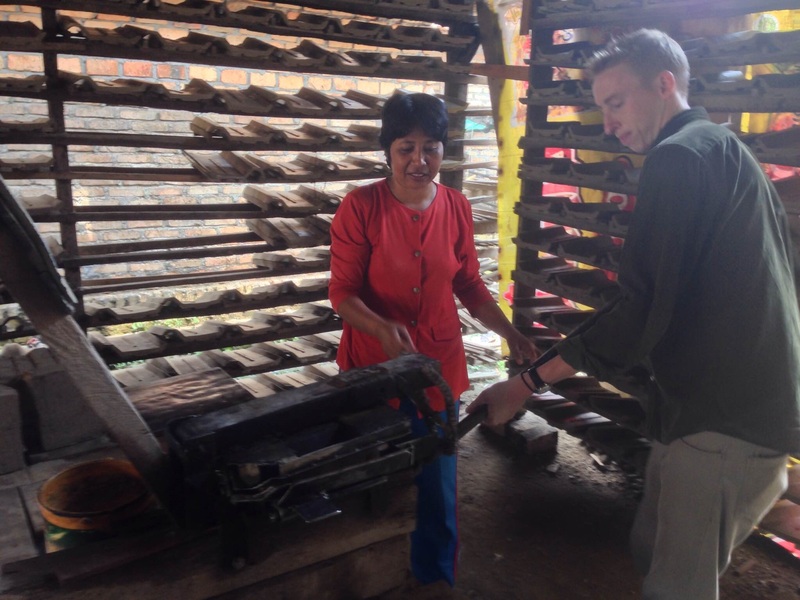 Her family lives in a village in which all the members practice the same trade: making roof tiles (genting). After watching them make a few tiles, he tried it out himself. It turned out like the others, but took twice the time! 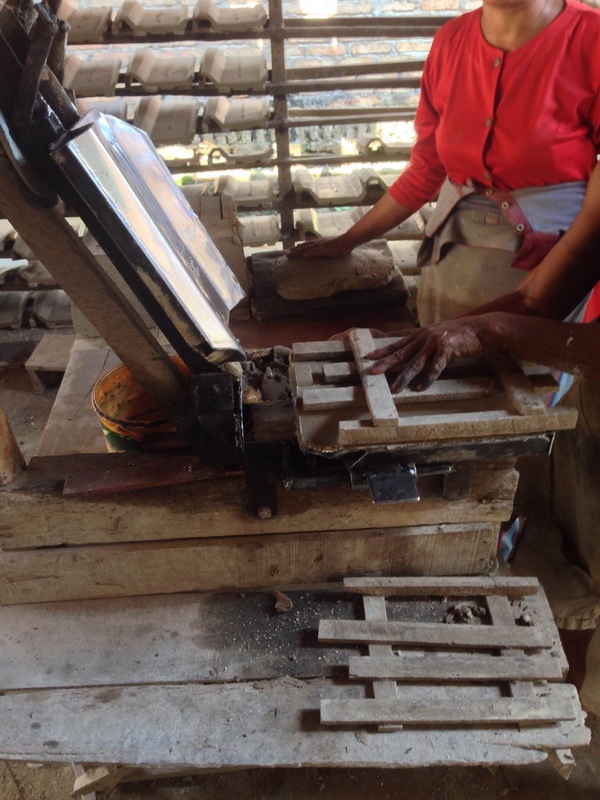 In a day, the family can make about 1000 tiles using this hand-operated machine. 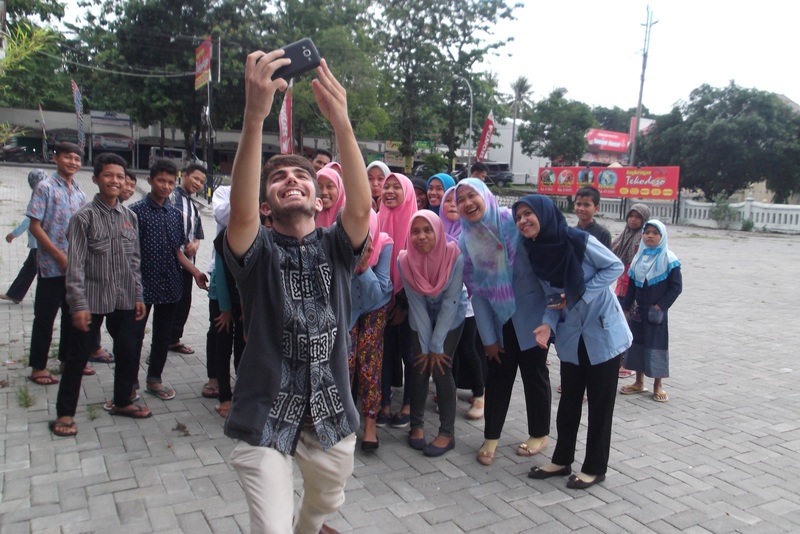 English Club is held 3 days a week at SMAN 7 Bandar Lampung and for the end of the semester, the club hosted a school-wide tour guide competition. With the help of the school’s English teachers, the club organized three rounds of selection. The first is an in-school competition, where participants presented their choice of three tourist sites within the Lampung province. The second was a held at the Museum Lampung in Bandar Lampung, while the last round was held in the gorgeous Pahawang Island in the neighboring Pesawaran Regency. From over 60 participants, it came down to 15 lucky contestants that guided the English teachers, ETA Ramon Caleon, and guest tourist Rebecca Selin (SMK 2) around several islands off the coast of Sumatra. 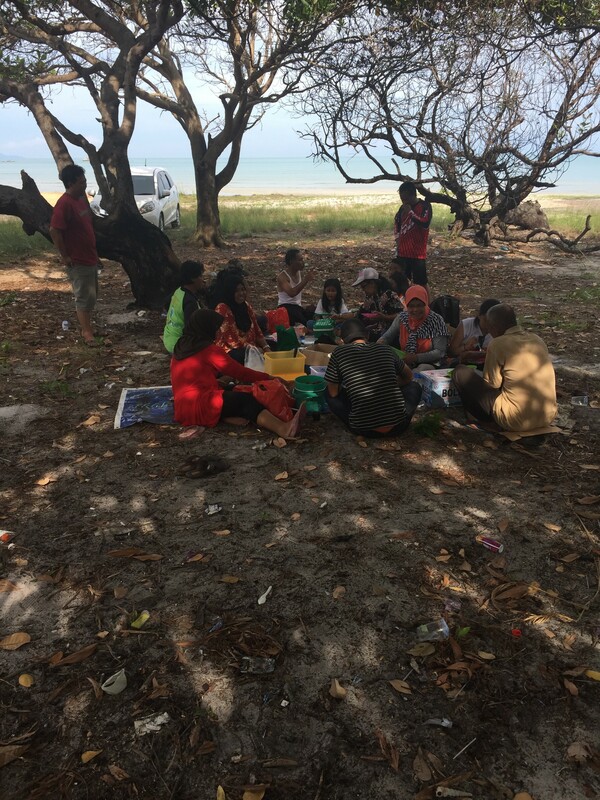 On December 9th, Ms. Jordan was invited to take part in a beach outing with some of the teachers, their families and a few students from the ‘Electro’ Department at SMKN 2 Pangkal Pinang. 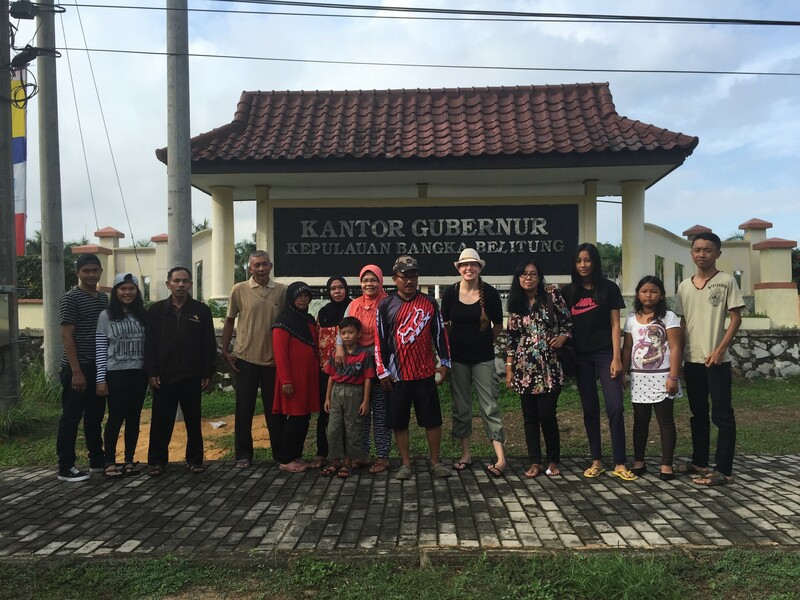 On their way to the beach they passed by the Kantor Gubernur [Governor’s Office] of Bangka-Belitung and had to stop and snap a photo. Ironically, it was a holiday because of local elections taking place across the island so the stop seemed extra fitting! The beach in the southern part of Bangka Island was one of the prettiest, and rockiest, seen by Ms. Jordan so far on her tours of Bangka. It was the backdrop of a short ‘memory’ film that Ms. Jordan’s teachers and students will edit in order for both Ms. Jordan and SMKN 2 Pangkal Pinang to remember her time in Indonesia! 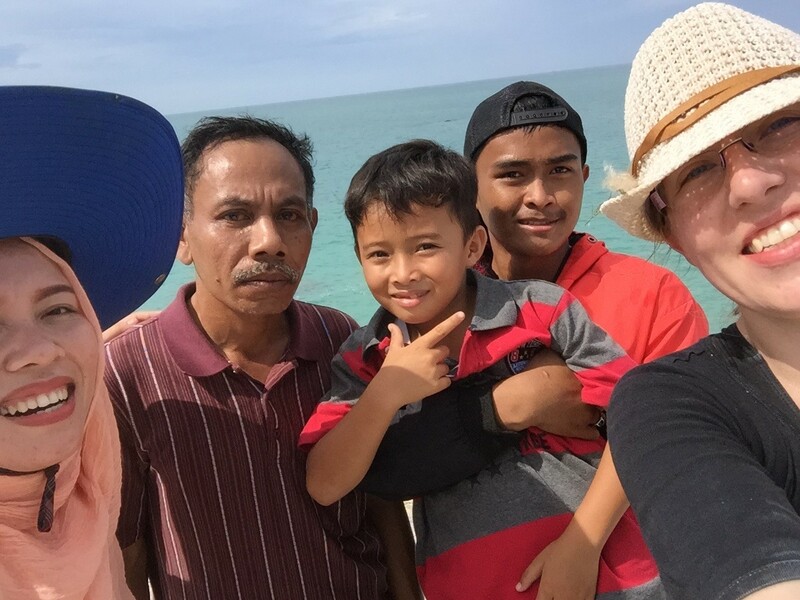 Here she is ‘selfie-style’ with two teachers, one of the teacher’s children, and a student of SMKN 2 after their walk up a massive stone cliff overlooking the beach. Of course going to the beach always means sharing a meal. Ms. Jordan snapped this photo at lunchtime just after coming back from swimming in the ocean with some of the teacher’s children. The amount and selection of food was amazing. Ms. Jordan continues to wonder not only when there is time to cook, but also how much of the food manages to fit into the cars, which are already full of people and bags. Being able to take part in activities with her school community outside of the school is important to Ms. Jordan and she feels very privileged to have such a wonderful group of teachers that offer to share their time with her. This is Savannah’s co-teacher and her making progress in their students’ batik class that they joined, discovering that it is much harder than it looks. After sketching the design out with pencil on the white fabric, they apply hot wax with tjanting tools. The ideal goal is to nicely trace their pencil with the wax, however, that is much easier said than done. 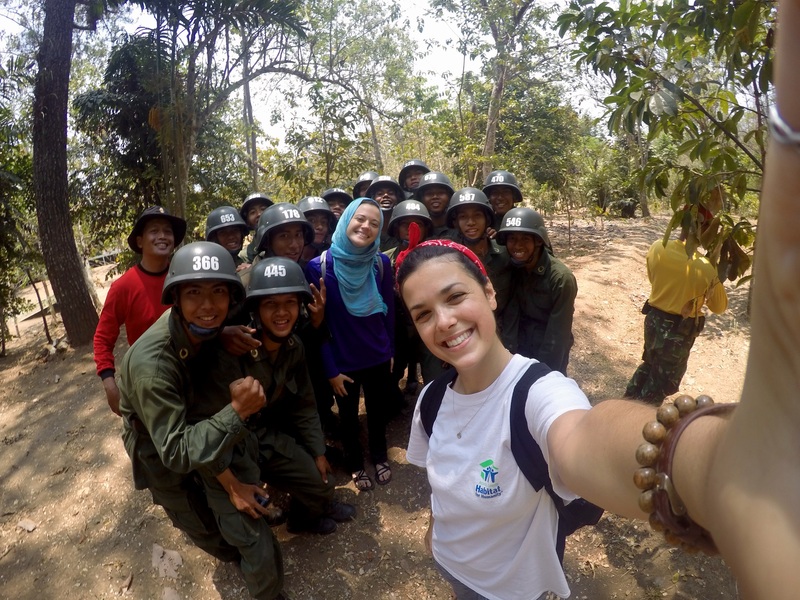 Magelang ETAs Safiyah and Savannah accidentally ended up at a military academy after hiking Mount Tidar. They were a little nervous when the officials stood up and starting calling out to others, thinking perhaps they had unintentionally trespassed. However, it was nothing more than an opportunity to take a group selfie. ETA Savannah Trifiro wanted to go out shopping for her classes, and one of her co-teachers decided to accompany her. Not only did they come out of the store with a seemingly endless supply of masks, but they also got this picture. Safiyah and Savannah with friends at their family-run Kupat Tahu warung. Aside from serving a delicious, vegetarian-friendly dish, this family is incredibly welcoming to both ETAs each time they visit. Not once have they been greeted with anything but smiles and friendly banter. To celebrate the 58th anniversary of SMA Negeri 1 Yogyakarta, ETA Julia Xia played gamelan with fellow teachers as a student performed wayang kulit, a Javanese shadow puppet show that tells tales of classic Hindu epics. Wayang typically stretches throughout an entire night until morning, and the enchanting tones of a gamelan orchestra, the theatrical voices of the many storyline characters, and the resounding laughter of an audience entertained for hours by a single puppet master was an unparalleled cultural experience. On December 17th, Ms. Jordan took part in an interview with students from Poltekkes Kemenkes Pangkal Pinang, which was set up by the administrators at SMKN2 Pangkal Pinang. Poltekkes Kemekes is a technical pharmacy university with a branch in Pangkal Pinang. These wonderful students had to interview a foreigner as a homework assignment for their English class and Ms. Jordan was honored and happy to offer her services. Here is Ms. Jordan mid-interview, thinking of responses to their questions. Some of them were easy, ‘What have you done in Bangka since you arrived?’ while others were more difficult, ‘What do you think of the school system in Indonesia?’ but Ms. Jordan tried to answer each one as best she could. It was a pleasure to meet the university students and have them practice their English both during and after the interview. She hopes that they will visit her again so that she can get to know them better than just the brief interview session allowed. 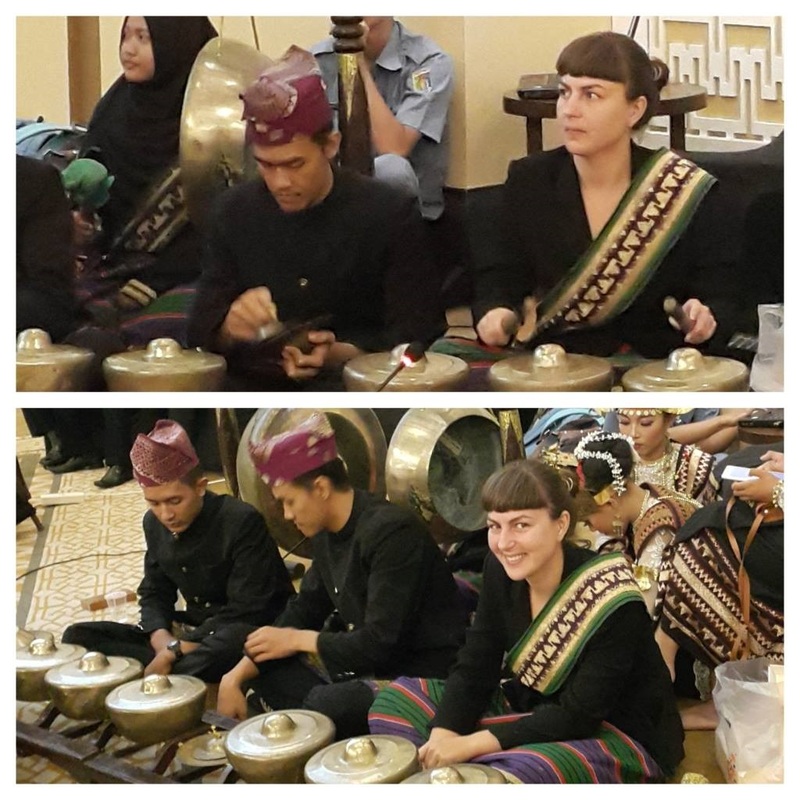 ETA Rebecca Selin joined the traditional Lampung Talo Balak ensemble for a private event at a Bandar Lampung hotel. She has been studying Lampung music at Universitas Lampung throughout the grant, but this December event was her first performance. 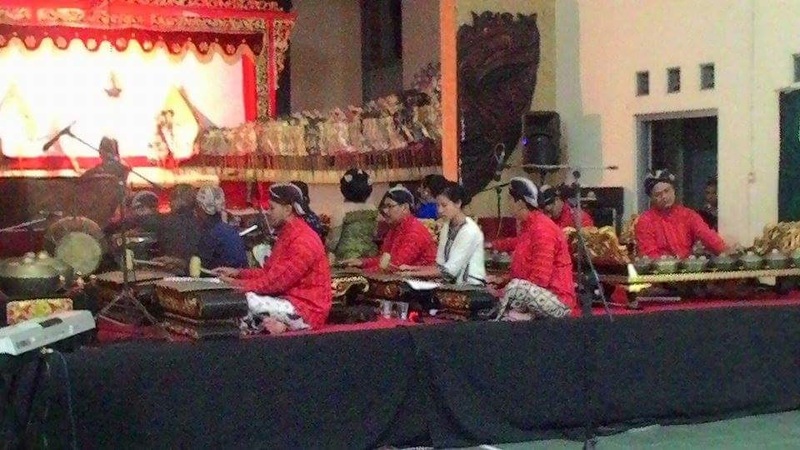 The music ensemble accompanied dancers in the Siger Pengunten dance, a famous Lampungese dance. In the picture, Rebecca joins members of UKMBS (Unit Kegiatan Mahasiswa Bidang Seni) Universitas Lampung in wearing Lampung tapis. ETA Bryan Howard, celebrated his 23rd birthday with everyone who lives at Panti Sosia Asuhan Anak Budhi Bhakti, the orphanage in Wonosari. 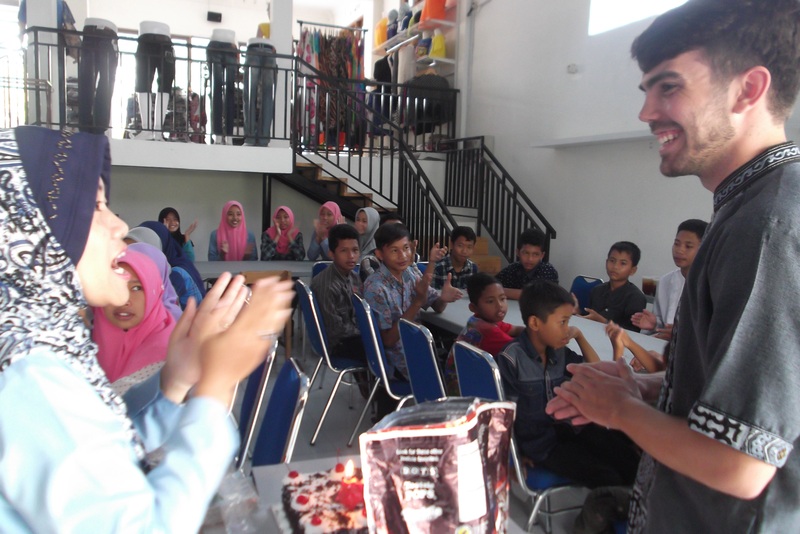 They shared lunch and birthday cake, and Bryan got to know all of the kids—ages 6 to 17—and hear about their dreams for the future, in Indonesian and English! 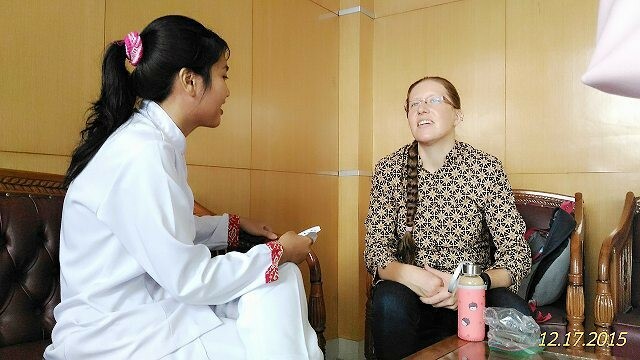 Grace Wivell joins an English Club at Magna Hotel each week, so that employees at the hotel have the opportunity to practice English with a native speaker. This also provides Grace with the chance to learn more about the history and customs of the local area from the knowledgeable staff there. Here members of the club can be seen practicing giving advice to guests about places to visit, with Grace listening to one pair who is demonstrating their conversation. Since September, ETA Kelly Fitzgerald has held a Photography Club for interested students at SMAN 3 Pangkal Pinang. Photography Club meets Wednesday afternoons at 4:30. During club meetings, students share photos they have taken and get feedback from other students. Photography Club has also hosted professional photographers who teach the students the basics of photo composition and the mechanics of using a camera as well as all of the features available on cell phone cameras. During the first semester Photography Club took a couple of field trips to the local port and botanical garden, and next semester the students are eager to do more photo-related field trips in other parts of Pangkal Pinang. 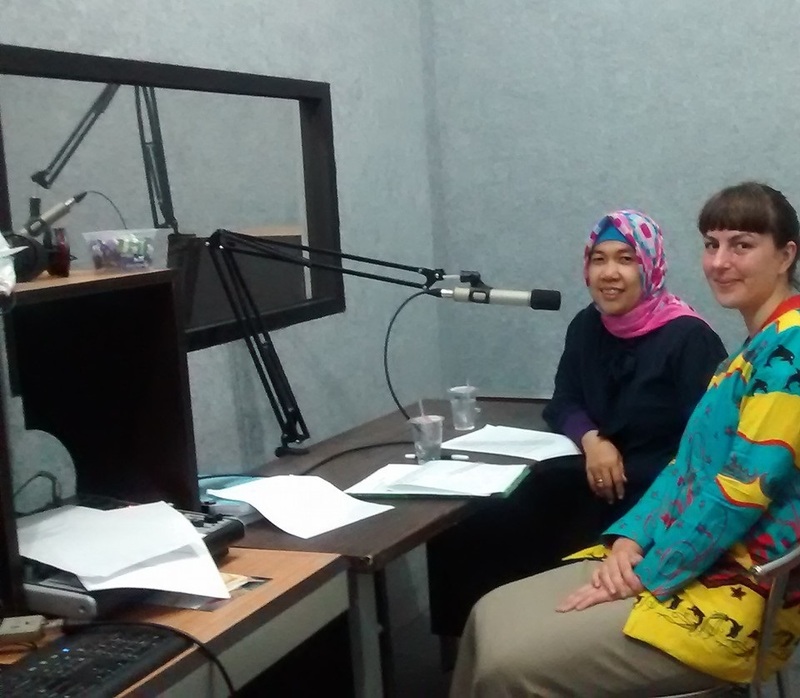 Throughout the semester Rebecca Selin and co-teacher Ibu Halimatusakdiah made several visits to the Lampung office of education to contribute to an educational podcast series. They recorded several full-length English lessons as well as many short English vocabulary audio bites. Ramon Caleon, the other ETA in Bandar Lampung, also contributed to help explain such expressions as “raining cats and dogs” to the youth of Lampung province. In the picture, Rebecca is wearing traditional Lampung batik.